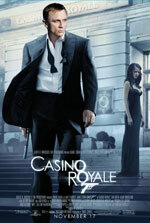 19.4.2017 Josef Křehnáč inserted real photo of the filming location Casino Royale of the Movie Casino Royale. 12.4.2017 Josef Křehnáč inserted real photo of the filming location The Splendide hotel of the Movie Casino Royale. 17.2.2015 veggiepete inserted real photo of the filming location Grand Canal, Venice of the Movie Casino Royale. 17.2.2015 veggiepete inserted filming location Grand Canal, Venice of the Movie Casino Royale. 17.2.2015 veggiepete inserted real photo of the filming location Mr White's Villa of the Movie Casino Royale. 17.2.2015 veggiepete found address of the filming location Mr White's Villa of the Movie Casino Royale. 17.2.2015 veggiepete inserted filming location Mr White's Villa of the Movie Casino Royale. 15.2.2015 veggiepete inserted real photo of the filming location Mr. White villa of the Movie Casino Royale. 14.4.2012 Bean inserted real photo of the filming location Stairs in the hotel in Venice of the Movie Casino Royale.